School property taxes fell significantly from 2001 to 2002. * But that relief eroded over time, as noted in part 1 of this series; homeowners have been particularly hard hit. The growth in homeowners’ share of the school property tax bill is not the result of real school spending increases, but the nuances of Minnesota’s property tax system. Minnesota’s property tax system is complicated. To determine the actual taxes paid by homeowners and businesses, we must account for regional tax base sharing programs, various credits (including the education homestead credit and its successor, the homestead market value credit), and other factors. We estimated school property taxes paid by homeowners and businesses since 2001 based on Minnesota Department of Revenue data. 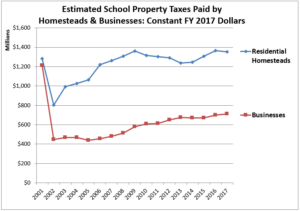 In subsequent years school property taxes paid by homeowners increased at a more rapid clip than that of businesses, particularly during the period from 2003 to 2009 and 2015 to 2017; between these two periods, the plunge in home values driven by the burst housing bubble suppressed homestead tax increases. In nominal dollars school property taxes paid by homeowners statewide surpassed the 2001 level in 2006, as the 2002 school tax relief was wiped out in four short years. From 2002 to 2017, school property taxes on homeowners increased by about 61 percent. For businesses, on the other hand, school property taxes were still below the 2001 level in 2017. In real dollars the rate of growth in school property taxes slows relative to the nominal growth, but the general pattern is similar. For homeowners the school property tax relief distributed in 2002 was gone by 2008. By 2017, homeowners’ real school property taxes were 6% greater than in 2001 and 68% greater than in 2002. The real school property taxes of businesses, on the other hand, were still 41 percent below the 2001 level in 2017. The rapid growth in homeowners’ school property taxes from 2002 to 2017 is surprising, given that the homestead share of the statewide tax base dropped significantly. The homeowner share of school property taxes grew, despite the relative shrinkage in homeowner tax base, for several reasons. For example, interactions between class rate changes enacted in 2001 and regional tax base sharing programs contributed to sharp homeowner property tax increases in 2003. Another factor that pushed aggregate homeowner property taxes upward in the years immediately following 2002 was the limited market value repeal, which increased the share of homeowner value subject to taxation. The increase in referendum market value (RMV) levies drove up school property tax payments by homeowners more than any other factor. As we noted in part 1, RMV levies fall more heavily on homeowners than tax capacity levies do. As real per pupil state aid to school districts declined in the decade following the 2002 property tax reductions, districts were forced to rely more heavily on RMV levies. As dependence on RMV levies increased, the share of school property taxes borne by homeowners also increased. The result was the rapid escalation in the school property taxes paid by Minnesota homeowners. Increases in state aid to school districts enacted in 2013 and subsequent years were critically important in helping to restore real per pupil funding to the 2002 levels (school fiscal year 2003)—the first year of nearly full state funding of general education costs. But these increases were not large enough to undo the post-2002 school property tax increases or reverse the shift in school property taxes unto Minnesota homeowners. 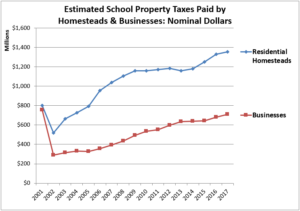 The large increase in homeowners’ school property taxes from 2002 to 2017 is not the result of increased real per pupil district spending or increased homestead valuations. The real driver of these homeowner tax increases were state policies—especially the school aid reductions that forced increased dependence on referendum market value levies. *All dates in this article reflect the tax payable year. Tax payable year property taxes are used to fund school operations in the subsequent school fiscal year. For example, taxes payable in 2002 are used to pay for school operations in fiscal year 2003. †Real property tax amounts in this article are expressed in constant 2017 dollars. The conversion to constant 2017 dollars is based on the Implicit Price Deflator for State and Local Government Purchases, which is the appropriate index to use when adjusting school revenues and expenditures for the effects of inflation. ‡The large reduction in property taxes paid by businesses to all levels of local governments—including school districts—was offset to a considerable extent by the creation of a new business property tax that was paid directly to the state. Since 2002, the state business property tax—which was capped at the rate of inflation—contributed to the low rate of growth in business property taxes relative to homesteads and most other classes of property. Effective for taxes payable in 2018, the state business property tax is frozen, meaning that it will decline in real per capita dollars from year to year. With the advent of the freeze, the state business property tax will become an even better deal for Minnesota businesses.